An electronic nose (e-nose), the Cyrano Sciences' Cyranose 320, comprising an array of thirty-two polymer carbon black composite sensors has been used to identify six species of bacteria responsible for eye infections when present at a range of concentrations in saline solutions. Readings were taken from the headspace of the samples by manually introducing the portable e-nose system into a sterile glass containing a fixed volume of bacteria in suspension. Gathered data were a very complex mixture of different chemical compounds. Linear Principal Component Analysis (PCA) method was able to classify four classes of bacteria out of six classes though in reality other two classes were not better evident from PCA analysis and we got 74% classification accuracy from PCA. An innovative data clustering approach was investigated for these bacteria data by combining the 3-dimensional scatter plot, Fuzzy C Means (FCM) and Self Organizing Map (SOM) network. Using these three data clustering algorithms simultaneously better 'classification' of six eye bacteria classes were represented. Then three supervised classifiers, namely Multi Layer Perceptron (MLP), Probabilistic Neural network (PNN) and Radial basis function network (RBF), were used to classify the six bacteria classes. A [6 × 1] SOM network gave 96% accuracy for bacteria classification which was best accuracy. A comparative evaluation of the classifiers was conducted for this application. The best results suggest that we are able to predict six classes of bacteria with up to 98% accuracy with the application of the RBF network. This type of bacteria data analysis and feature extraction is very difficult. But we can conclude that this combined use of three nonlinear methods can solve the feature extraction problem with very complex data and enhance the performance of Cyranose 320. Despite the robustness of the eye, there is no doubt that it is exposed to a harsh environment where it is continually in contact with infectious airborne organisms. The function of the eyelids and production of tears help to protect the eye. However the warm, moist, enclosed environment, which exists between the surface of the eye (conjunctiva) and the eyelids, also provides an environment in which contaminating bacteria can establish an infection. The most common bacterial eye infection is conjunctivitis and organisms such as Staphylococcus aureus, Haemophilus influenzae, Streptococcus pneumoniae, Escherichia coli have been associated with this condition . The number of organisms responsible for infection of the eye is relatively small; nevertheless the consequences are always potentially serious as the eye may become irreversibly damaged. Rapid diagnosis is therefore essential but currently relies on time-consuming isolation and culture of the infectious agent, and use of precise analytical instruments (e.g. liquid chromatography or optical microscopy). Since it is very important that the nature of the infection is diagnosed as quickly as possible, it is clear that techniques such as a neural network based e-nose, which can almost instantly detect and classify odorous volatile components, could make a major contribution . The term electronic nose (e-nose) describes an electronic system that is able to mimic the human sense of smell. These systems have been the subject of much research at the University of Warwick over the past 20 years or so. E-nose systems use a number of different gas sensors depending on the application, e.g. metal oxide chemoresistors, conducting polymer chemoresistors, etc. Other aroma-based techniques exist, however while gas chromatograph or mass spectrometry techniques can be used to separate, quantify and identify individual volatile chemicals, they do not indicate whether the compounds contain an odour or not. Therefore e-noses have been developed to improve on and to complement these techniques, and thus provide a better emulation of the human system for sensory analysis. Researchers are currently developing a new generation of artificial e-nose in order to build smaller and cheaper systems that thus will find application in the consumer marketplace. Research also focuses on the data processing aspects, exploring possibilities to integrate new techniques such as neural networks, fuzzy logic and genetic algorithms in order to develop the intelligent e-nose. Nearly twenty years of development, e-nose technology has been applied in various fields such as the food, drinks and cosmetic industries. More recently research has been directed towards health and safety issues , for example in the medical arena and medical diagnosis, food quality and control, environmental monitoring. E-nose systems have already been used with success in the medical domain , for microbial detection , and bioprocess monitoring . In this paper we describe the use of Cyrano Sciences' Cyranose 320 to identify six species of bacteria, which are believed to be responsible for eye infections, when present at a range of concentrations in saline solutions. The bacterial samples used in this experiment are among the most common bacterial pathogens responsible for eye infection i.e. Staphylococcus aureus (sar), Haemophilus influenzae (hai), Streptococcus pneumoniae (stp), Escherichia coli (eco), Pseudomonas aeruginosa (psa) and Moraxella catarrhalis (moc). All bacteria were grown on blood or lysed blood agar in standard petridishes at 37°C in a humidified atmosphere of 5% CO2 in air. After overnight culturing, the bacteria were suspended in sterile saline solution (0.15 M NaCl) to a concentration of approximately 108 colony forming units (cfu)/ml. A ten-fold dilution series of bacteria in saline was prepared and three dilutions (d1 = 108, d2 = 105 and d3 = 104 cfu/ml) were sniffed using the e-nose. The numbers of viable bacteria present were confirmed by plating out a small aliquot of the diluted samples and counting the resultant colonies after overnight incubation. The e-nose used was Cyrano Sciences' Cyranose 320, a portable system (see Figure 1), who's component technology consists of 32 individual polymer sensors blended with carbon black composite, configured as an array. When the sensors are exposed to vapours or aromatic volatile compounds they swell, changing the conductivity of the carbon pathways and causing an increase in the resistance value that is monitored as the sensor signal. The resistance changes across the array are captured as a digital pattern that is representative of the test smell. The sensor technology yields a distinct response signature for each vapour regardless of its complexity; the overall response to a particular sample produces a 'smell print' specific to a stimulus (Cyr ano Sciences, USA ). See Figure 2 for a typical response of the Cyranose 320. Typical Cyranose 320 electronic nose. Typical response from Cyranose 320, displayed in PCNOSE Software. For the eye bacteria tests, the Cyranose 320 was introduced manually to a sterile glass vial containing a fixed volume of bacteria in suspension (4 ml). The operation was repeated ten times for each one of the three dilutions of each of the six bacteria species, to give a total of 180 readings. These data was gathered through a whole week. The choice of the data pre-processing algorithm has been shown to affect the performance of the pattern recognition stage. Software written in MATLAB 6.1 was used to extract features from the data in terms of the static change in sensor resistance. See Figure 2 for a typical response of the Cyranose320. All data was normalized using a fractional difference model: dR = (R - Ro) / Ro where R is the response of the system to the sample gas, and Ro is the baseline reading, the reference gas being the ambient room air. The complete bacteria data set was then normalized, by dividing each dR by the maximum value for each sensor, in order to set the range of each sensor to [0, 1]. The use of Principal Component Analysis (PCA), Fuzzy C Means (FCM) and Self Organizing Map (SOM) to assess clustering within the data set is now discussed [8, 9]. These exploratory techniques are used to investigate how the data cluster in the multi-sensor space. Several techniques were applied to verify that the categories established by each were not arbitrary and the groups formed match the six types of bacteria. The objective of this analysis was to establish simple classes for the different bacteria species in order to examine whether or not the data clusters could be separated in preparation for the pattern recognition stage. PCA is an effective linear method for discriminating between the e-nose responses to simple and complex odours . The method consists of expressing the response vectors in terms of a linear combination of orthogonal vectors that account for a certain amount of variance in the data. The results of the PCA are shown in Figure 3. Three principal components were kept, which accounted for 99.87% of the variance (PC 1, PC 2 and PC 3 representing respectively 98.82%, 0.94% and 0.11%). 6 categories or clusters appear to be evident. The six clusters formed match the six types of bacteria so that the bacteria were completely separated in the principal component space but classification accuracy was upto 74%. 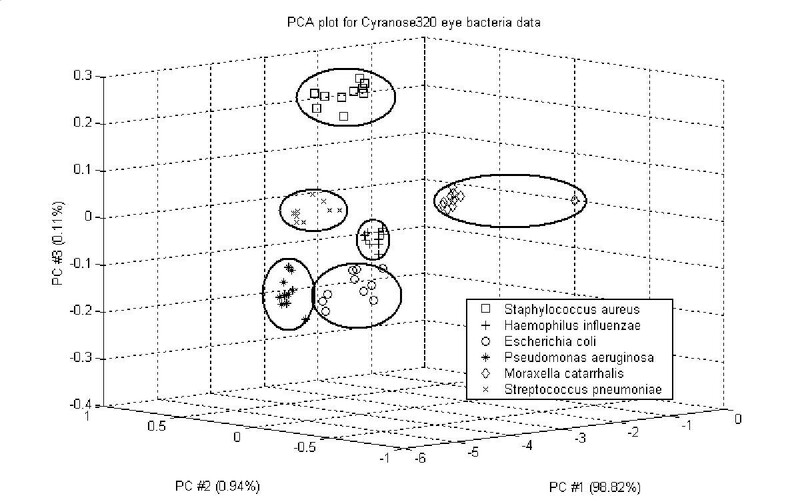 From PCA analysis four classes of bacteria namely Staphylococcus aureus (sar), Haemophilus influenzae (hai), Streptococcus pneumoniae (stp) and Moraxella catarrhalis (moc) were properly classified though other two most common classes of eye bacteria like Escherichia coli (eco), Pseudomonas aeruginosa (psa) were not properly classified (see Figure 3). Most of the variance in the data is explained by considering only the first principal component (PC1), which implies that the sensor responses are highly correlated. As PC1 accounts for most of the information in the data, this suggests that the clusters were not made any more evident using PCA. That is linear PCA analysis is not informative for this type of data. The objective of this analysis was to establish simple classes for the different bacteria species in order to examine whether or not the data clusters could be separated, prior to the conventional pattern recognition stage. Plots of the results from PCA for six classes of bacteria. 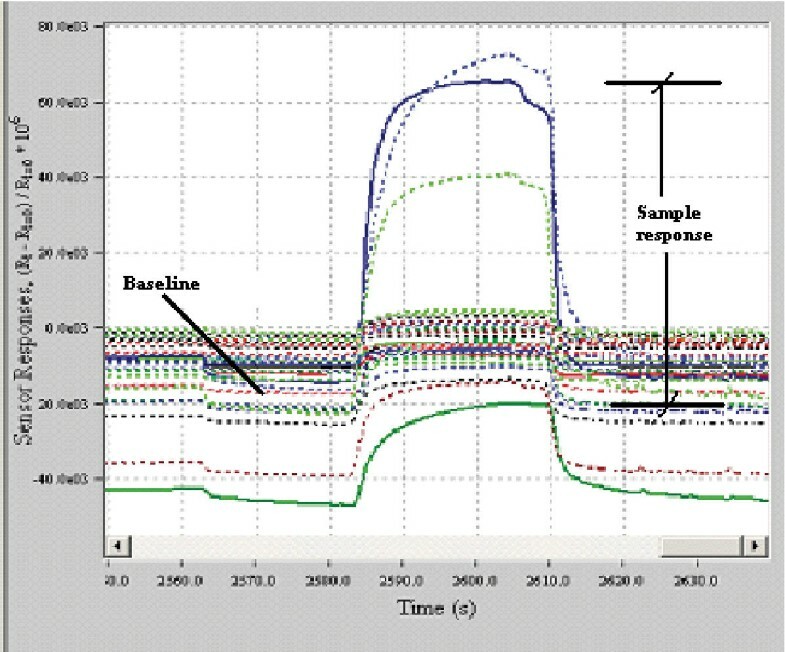 Previous tests experiences with the Cyranose 320 system suggests that some of the sensors could be omitted for data analysis. This is because sensors are highly correlated in nature. The best representation of the information in the data can be achieved only if we can represent our data by using the least correlated sensors. Hence we calculated the correlation coefficients of the sensors by evaluating the sensor response matrix using the MATLAB 6.1 function "corrcoef " ; where each row is an observation (The gathered response of the sensors), and each column is a variable (sensor). Using the MATLAB 6.1 function "corrcoef"  on the whole data set a matrix of correlation coefficient was achieved; then least correlated sensors were selected by doing column wise summation of the correlation coefficient matrix and sorting the minimum added values. Load values of the all sensors were also considered for least correlated sensors selection. It was evident that effectively the three least correlated sensors are sensor 23, 24 and 26 from correlation coefficient matrix. SOM and FCM were applied to the data set in order to investigate clustering using the responses from the 32 sensors. A SOM network is a non-linear Artificial Neural Network (ANN) paradigm, which is able to accumulate statistical information about data with no other supplementary information than that provided by the sensors . Various SOM networks were created and trained with the entire data set, subsequently samples were associated with one of the neurones and neurones were grouped together to form categories corresponding to each identified bacteria. FCM is a fuzzy data clustering and partitioning algorithm in which each data point belongs to a cluster according to its degree of membership . With FCM, an initial estimate of the number of clusters is needed so that the data set is split into C fuzzy groups. A cluster centre is found for each group by minimising a dissimilarity function. Fuzzy clustering essentially deals with the task of splitting a set of patterns into a number of more-or-less homogeneous classes (clusters) with respect to a suitable similarity measure such that the patterns belonging to any one of the clusters are similar and the patterns of different clusters are as dissimilar as possible. The similarity measure used has an important effect on the clustering results since it indicates which mathematical properties of the data set should be used in order to identify the clusters. Fuzzy clustering provides partitioning results with additional information supplied by the cluster membership values indicating different degrees of belongingness . An innovative data clustering approach was investigated for these bacteria data by combining the 3-dimensional scatter plot, FCM and SOM network. This is depicted in the Figure 4. 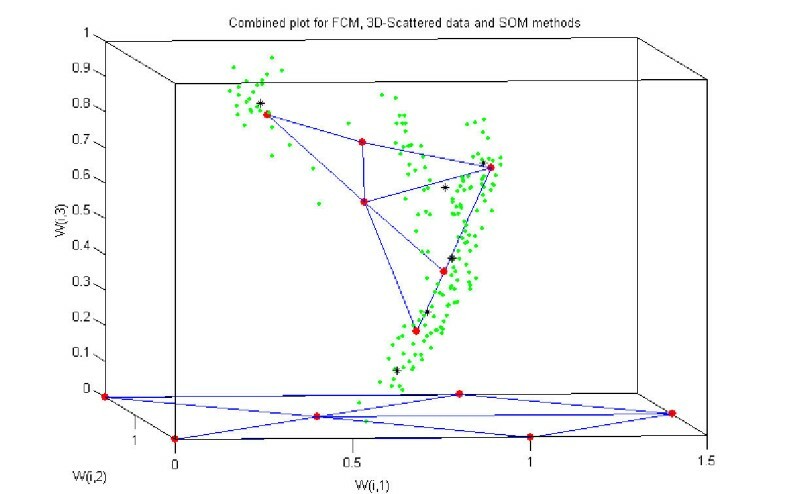 In multisensor space, normalised data sets were represented using 3-D scatter plots. From the FCM approach, a cluster centre is found for each group by minimising a dissimilarity function . These cluster centres were plotted in multisensor space. So combining the 3D scatters plot and FCM, cluster centres were properly located in multisensor space and also within the data. Various SOM networks were created and trained with the entire data set; a [6 × 1] and a [3 × 2] SOM network performed best from all other SOM networks. In the Figure 4 there are six neurones at the bottom which indicate the initial weights of the SOM before training. After 5000 epochs it was clear that the six nodes were approaching to the six cluster centres (estimated using FCM), which is more clearly evident from Figure 4. So using these three data clustering algorithms simultaneously better 'classification' of six eye bacteria classes were represented. A [6 × 1] SOM network gave 96% accuracy for bacteria classification which was best accuracy as far as SOM networks are concerned along with FCM and 3D-Scatter methods. The objective of this analysis was to establish simple classes for the different bacteria species in order to examine if the data clusters could be separated for the conventional pattern recognition stage. Combined plot for the FCM, 3D-Scatter and SOM methods for six classes of bacteria. The six different bacteria dataset were analyzed using three supervised ANN classifiers, namely the Multi Layer Perceptron (MLP), Probabilistic Neural network (PNN) and Radial basis function network (RBF) paradigms. Training of the neural networks was performed with 40% of the whole data set. The remaining 60% of the whole data were used for testing the neural networks. These percentages were selected arbitrarily and were applied for all data sets. The aim of this comparative study was to identify the most appropriate ANN paradigm, which can be trained with best accuracy, to predict the "type of eye infections" or in other words "type of eye bacteria". A MLP network (with learning rate equal to 0.2 and a momentum term equal to 0.3) with 3–32 inputs and 6 output neurons was able to reach a success rate 75% in classification. Neurons are added to the network until the sum-squared error (SSE) falls beneath an error goal (0.000001) or a maximum number (40) of internal neurons was reached. It is important that the spread parameter be large enough so that the radial basis neurons respond to overlapping regions of the input space, but not so large that all the neurons respond in essentially the same manner . For both the networks the spread parameter was set to 1.0. PNN was able to correctly classify 94% of the response vectors where as the RBF network's level of correct classification was up to 98%. A t-test was performed to assess if RBF, PNN were performing significantly better than the MLP in terms of the total number of patterns correctly classified. The null hypothesis H0 demonstrated that there was no significant difference between the mean number of patterns misclassified by the RBF and PNN. The hypothesis H0 was rejected at the 4% significance level (t = 2.19 for RBF and t = 4.49 for PNN). This type of bacteria data analysis and feature extraction is very difficult. We can conclude that this combined use of three nonlinear methods (3D-Scatter plot, SOM, FCM) can solve the feature extraction problem with very complex data and enhance the performance of Cyranose 320. Later on two supervised ANN classifiers, PNN and RBF, were able to predict the six different bacteria classes with 94% and 98% accuracy respectively; where the training of the supervised ANN classifiers were performed using 40% of the whole data set for the six bacteria. Linear PCA method was able to classify four classes of bacteria out of six classes though in reality other two classes were not better evident from PCA analysis and we got 74% classification accuracy from PCA. An innovative data clustering approach was investigated for these bacteria data by combining the 3-dimensional scatter plot, FCM and SOM network. Using these three data clustering algorithms simultaneously better 'classification' of six eye bacteria classes were represented. A [6 × 1] SOM network gave 96% accuracy for bacteria classification which was best accuracy. Then three supervised classifiers, namely Multi Layer Perce ptron (MLP), Probabilistic Neural network (PNN) and Radial basis function network (RBF), were used to classify the six bacteria classes. A comparative evaluation of the classifiers was conducted for this application. The best results suggest that we are able to predict six classes of bacteria with up to 98% accuracy with the application of the RBF network. So from these results we can conclude that in future we can create a 'knowledge base of extracted features' by applying three nonlinear methods like 3D-Scatter plot, SOM and FCM for each bacteria class. So in future if we have an input dataset from unknown bacteria, by applying these three methods in a combined manner we can extract some feature for that unknown class of bacteria; later on we can match with the existing knowledge base of classes of bacteria features to predict the bacteria class. For this matching purpose, supervised ANN classifiers like PNN or RBF can be used with very high accuracy. This type of bacteria data analysis and feature extraction is very difficult. But we can conclude that this combined use of three nonlinear methods along with RBF neural network can solve the feature extraction problem with very complex data and enhance the performance of Cyranose 320.